LISTED HERE ARE THE NAMES OF THE OFFICERS, ENLISTED MEN AND CONSCRIPTS OF THE ARMIES OF THE CONFEDERATE STATES OF AMERICA WHO DIED OF SMALLPOX NEAR THIS SPOT BETWEEN AUG 1, 1863 AND MAR. 31, 1865. THESE SOLDIERS HAD EACH CONTRACTED THE DISEASE WHILE BEING HELD AS PRISONERS OF WAR AT THE FEDERAL MILITARY PRISON LOCATED ACROSS THE MISSISSIPPI RIVER IN ALTON, ILLINOIS. 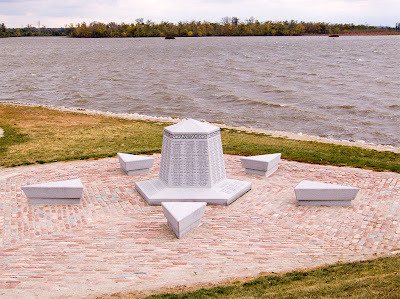 ONCE INFECTED WITH THIS HIGHLY CONTAGIOUS DISEASE, PRISONERS WERE TRANSPORTED TO A TEMPORARY HOSPITAL LOCATED ON A SMALL ISLAND FORMERLY LOCATED IMMEDIATELY UPSTREAM OF THIS MONUMENT. THERE EACH OF THESE MEN STOICALLY SUCCUMBED TO THE EFFECTS OF THE DISEASE. FOR 70 YEARS FOLLOWING THE WAR BETWEEN THE STATES, THE PRECISE LOCATION OF THESE SOLDIERS GRAVES WAS UNKNOWN. THEN IN 1935, A PORTION OF THE CEMETERY WAS INADVERTENTLY DISCOVERED DURING CONSTRUCTION OF THE ORIGINAL LOCKS AND DAM 26. TODAY THE REMAINS OF THESE SOUTHERN PATRIOTS REST BENEATH THE REGULATION POOL OF THE MELVIN PRICE LOCKS AND DAM. THIS MONUMENT IS DEDICATED TO THEIR SACRIFICE AND MEMORY. THE ALTON PRISON WAS ORIGINALLY OPENED IN 1833 AS THE FIRST ILLINOIS STATE PENITENTIARY. IT REMAINED IN SERVICE UNTIL 1860 WHEN A NEW FACILITY WAS BUILT IN JOLIET ON FEBRUARY 9, 1862. THE VACANT STRUCTURE REOPENED AS THE ALTON FEDERAL MILITARY PRISON. DURING THE NEXT THREE YEARS, AT LEAST 11,764 CONFEDERATE SOLDIERS WERE HELD IN THIS FACILITY. BY ALL OBJECTIVE ACCOUNTS, CONDITIONS IN THE PRISON WERE SUBSTANDARD. THE MORTALITY RATE WAS HIGH. HOT HUMID SUMMERS AND COLD DAMP WINTERS UNDOUBTEDLY CONTRIBUTED TO THE HIGH DEATH RATE. OVERCROWDING, INADEQUATE FOOD AND CLOTHING, AND UNSANITARY CONDITIONS FURTHER COMPOUNDED THE PRISONERS MISERY. PNEUMONIA AND DYSENTERY WERE COMMON KILLERS, BUT CONTAGIOUS DISEASES LIKE SMALLPOX AND RUBELLA WERE THE MOST FEARED. THE SMALLPOX EPIDEMIC THAT BEGAN IN LATE 1862 ULTIMATELY PROMPTED PRISON OFFICIALS TO TRANSFER THE CONTAGIOUS PRISONERS TO A TEMPORARY QUARANTINE FACILITY, A SAFE DISTANCE FROM CIVILIAN RESIDENTS OF ALTON.